In the glow of flickering candles and a fireplace encased in glass, a vibrant crowd throws back fresh fruit cocktails and nibbles on ceviche soaked in lime with hunks of avocado or shrimp cóctel in citrusy tomato juice. This is the swank sibling to the adjacent Café con Leche, and while the classic Cuban and jibarito sandwiches are as good as they are next door, head straight to hearty entrées such as tender pork chops given an al pastor makeover or juicy skirt steak slathered in a sauce of roasted arbol chilies and pumpkin seeds and crowned with a tower of impressive onion rings. This place was not what I was expecting at all—in the best way possible. The space is beautiful—low light, dark wood, slightly romantic—but you'll find groups of all kinds dining there, from a group of old friends to a first date to a couple of Harley guys. 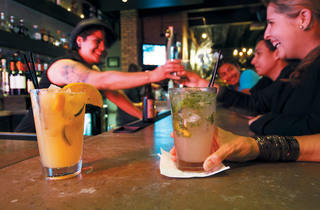 The food and the drinks are both amazing, and there's a lot more variety here than you might expect. 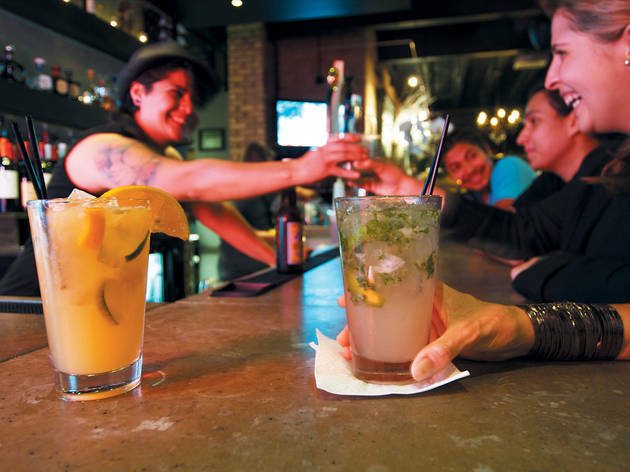 You can't go wrong with a margarita, and try the tostones.